Zota – Page 2 – Experienced Player with over 6000 games giving some mild tips, reviews, ideas, analysis and predictions for Dota 2. Dota 2 is a global game, but I wasn’t sure exactly how big it was in each region. I was determined to know, so I set off collecting data for an entire week in mid August 2014 in order to find out. My method for this article is to use the Waiting Queue to determine the Server Size. I can obtain data based on how many people are currently playing Dota, as well as data on how many people are waiting for a game of Dota per server. I can use this to extrapolate and create models to determine the size of player bases across the globe. Every day each server peaks and troughs at different time. Using this data, I can create a Server Range; the min and max range of players that are searching for a game at any point on each server. I have also taken samples from across the day, to determine the average amount of players searching per server. The average also helps determine the gradient; some servers have a very steep peak, others are much more gentle knolls. The image is a tad small here. But Russia and EUW are the two biggest servers, they very consistently have a high numbers of players on them. Conversely, in Dubai, Korea, and South Africa there is an incredibly small amount of players. Elsewhere in Asia, both Chinese servers are big, but they tend to fall off really hard. Each day, Chinese Dota outclasses SEA Dota overall, but Chinese servers don’t last very long. In SEA the servers are busy for hours on end, where as in China the servers seem to rise and fall really fast. This causes SEA to have about the average amount of players playing as the two Chinese servers combined, even though SEA peaks lower. In the Americas, all three servers are similar in size. Brazil has a hard fall off, but still manages to beat USW overall. USE is the biggest server in the region across the board. My theory is that the bigger your server is, the better the matchmaking will be. Playing on Australia you will likely get rather large difference in people’s unranked MMR, as well as less precise MMR across the board. In EUW however, the pool of players is about eight times bigger, which should cause far better matchmaking. It’s thus better for Dota 2 pubbers to have big scenes in small locations, rather than have small scenes all over the world. Being good on a South African server is meaningless, since you will consistently be put with opponents and allies that are severely under your skill level. This not only makes it harder to get better at the game, but will heavily impact your playstyle; causing you to be much more of a ‘one many army’ dota player. Working with my data, I can start to work out the demographics of the Dota population. Some players aren’t very faithful to their servers due to internet pathing, so I’ve split them up into regions. Players are likely to play at least within their region, such as Arabs on either Dubai or an European server, and Peruvians on one of the 3 American servers. While people can play anywhere, the vast majority of players are likely to play at least near them for ping reasons, with a very insignificant amount of say Russians playing in Korea. Over the course of a 24 hour day in each region, about 46% of the people searching for matches are from Europe, which includes the Middle East and Russia. A solid quarter of players are Chinese, although SEA is not too far behind. In the untitled part is other countries at 2.5%, with 1.9% being Australian. This data however is susceptible to a couple of outside factors, causing some limitations. In Australia, a very rich county where people game at home, a Dota 2 player can generally play when he wants to. He doesn’t have to travel to a Net Cafe, nor wait for money to afford to use one. In SEA however, Net Cafes are incredibly popular, which also means that the SEA server base is limited by the amount of computers available in Net Cafes, as well as their culture and opening hours. I said earlier that SEA servers were busy for long periods of time, where as China has a much more sudden peak. I actually predict that SEA is probably bigger than what is represented. 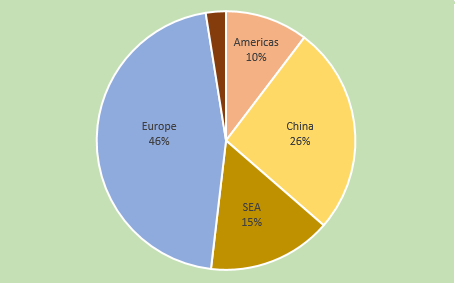 Overall this pie graph is a tricky one, especially when you consider time zones. Since more time zones will result in lower peaks and higher averages. I also know how many people have the Dota 2 client running, which is publicly available information. Generally, there seems to be about 5% of people with the Dota 2 client running searching for a game. It appears that Dota 2 peaks at about 8% of the total monthly player base each day, and that 15-20% of the Dota community play each day. Obviously the waiting queues get massive surges when a server fail, as people all rush to find a game. The odd thing however is that weekends don’t seem to increase the numbers of players playing. Both in total players online, and in players searching, weekends seem to have no to very little effect on Dota players. Restaurants get peaks on certain days, such as the weekends, whereas Dota doesn’t seem to have a weekly busy period. This blog has over 200,000 views in the past 12 months, but is 60% USA/UK/AUS/Canada. It has a fair amount of western Europe and SEA; both Vietnam and Poland are much higher than I would expect, and even have 28 views from Iraq. I imagine the Dota 2 Reddit would have a similar skew, being primarily the ‘five eyes’. The Server search range is solid data, but other data becomes incredibly difficult to get exactly right. I’ve tried to create logical models and have reliable information, excluding less reliable results from the article. Another article I am working on is how global events impact the Dota 2 player base. Primarily looking at the Ukraine-Russia crisis and the devastation it has caused to the Russian economy, as well as the Hong Kong democracy protests. My initial data suggests that they both have caused large declines in players. I also should mention that two new South American servers will be online shortly, and will keep my eye on how this impacts the player base. I am however very critical of this decision; the numbers tell me that to keep the player base the most sane, only one server should have been added. A server that caters to Spanish speaking South Americans. The new patch has been out for over a week now, which I feel is enough time to do a rundown in both win rate and play rate. I was picky in my data samples because of Techies. So I’ve chosen to compare all 6.82 data including 6.82b, with that of one week in September, a full week with Techies already in the game. Techies addition to Dota 2 should thus have much less of impact on this post. Note that all percents are raw percents, and show actual changes in the percent values. A lot of increases seem to be due to longer games and the Tier 1s being up for longer. Spectre and Omni received minor changes, but skyrocketed to win rates over 60%. There has only been one other time in the past 2 years where a hero had a win rate over 60% in the last two years; when Centaur Warrunner was added in October 2012. Even Spirit Breaker and Drow Ranger at their worst couldn’t consistently break 60%, and I can’t ever recall a higher win rate. Medusa is another interesting gainer – as she now has a 53.55% win rate – which makes her one of the stronger carries in pub Dota. Lets see if the pros take any notice of her. Some of the hero rises are also a bit odd; Earthshaker and Phoenix are somewhat unexpected. As for play rate, reworks and remodels take the top 3 spots, but Bloodseeker is entirely ignored. He only went up 0.5%, which is pretty negligible given the time frame. Axe went up, probably as people thought it was the best hero to try out Crimson Guard on. While Spectre was probably as people caught win of the win rate changes, although there’s been a lot of Crimson on her too. 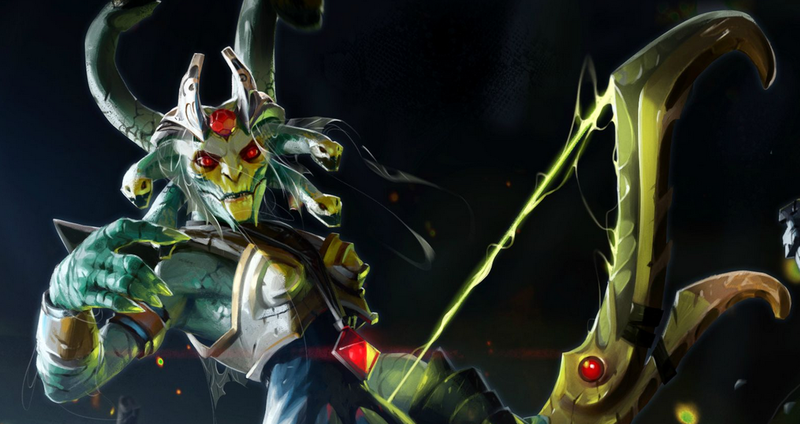 People were obsessed with Aghanim’s last major patch, but far less fuss for the new Aghs, with Bane, Phoenix and Puck’s changes mostly ignored, while Timbersaw and his foe Treant managed small gains off the back of their Aghs. Nerfs to the forever annoying global Tinker and Nature’s Prophet caused some happy losses, while Bloodseeker’s rework will take some getting used to. 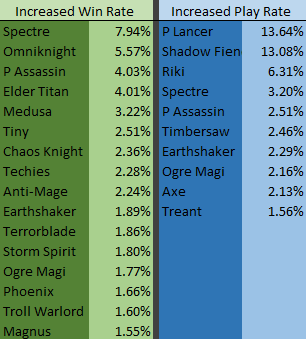 Phantom Lancer didn’t drop anywhere near enough, off the chart above at only -1.17%. I find Clinkz’ fall rather interesting, I assume people’s experimentation with orbs has resulted in less wins for the hero. This is likely as he’s already improving in win rate as the days tick by. This list isn’t overwhelmed with “early game heroes” either, it’s primarily nerfed heroes. Chen and Bane are highlights, although they both happen to perform incredibly badly against Phantom Lancer, who did get a massive surge in picks post patch. Lone Druid also had a solid loss. I removed Techies from the play rate, as he’s been decreasing as people move on from the original addition to the game. But apart from that it’s primarily the heroes who were nerfed. Tiny’s decrease is likely not to last; his win rate went up as seen in the first section. Although Tiny was not directly changed in the version, his win rate still shot up a remarkable 2.51%, which is notable. A few months ago I posted an article on Phantom Assassin, and how I thought the majority of pub players were building her ineffectively. I explained a couple of Key Concepts, such as the Evasion Window and put forwards some general ideas on the direction she should be built. I have had over 190,000 views on this site the past year, and this article happens to be my most viewed. So I’m going to do the same with Medusa, because I strongly feel like there are some Key Concepts with the hero that people are failing to grasp. Medusa has traditionally built as a Hard Carry, and even to this day people love to do so. There are a couple of problems with this however. The first is that Hard Carries are increasingly becoming extinct. Due to the various changes in the game, people are shifting heroes across the board to different roles and building them in ways that make them have a higher impact earlier on. Faceless Void for example – a hero who for years was refereed to as one of the hardest carries in the game – is increasingly being ultra effective when played not as a Hard Carry. To the point where pro players chuck him in the offlane, and have someone else as their 1 position hero. He is still great with lots of position 1 farm and items; people are simply playing differently to make him better earlier as the space for Hard Carries dwindle. The second problem is that Medusa has received a number of substantial buffs to her early game. Two years ago in 6.74 (TI2) Mana Shield started at an absorption rate of 0.75, and when maxed was increased to 2. Now however, this is an incredible 1.6 to 2.5. Just one level currently gives more than twice as much as an older level 1 of the skill, even giving more than the old level 3. Stone Gaze has also received incredible buffs. Reworked in 6.78, the new skill is now hugely effective in the early game. A previous level 6 Medusa would have a 140 second cooldown on Gaze, now it’s a very useful 90 seconds. Just those two skills alone are now ridiculously more potent earlier on. Her other skills are also equally stronger in the early game, more than they have ever been before. Why Would I Pick Her? The issue that arises is that people are building basically the same as they did 2 years ago, when her early game was criminally weak and Hard Carries were much more potent. With dwindling effectiveness of Hard Carries, and a considerably strong Early Game, it doesn’t make sense to me why everyone would still want to tunnel vision the late game. I’ve noticed people like to say things like “if I wanted an X, why wouldn’t I just pick a Y?”, such as “if I wanted a carry to fight early, why wouldn’t I just pick Lifestealer?” People use this X/Y reasoning every year, such as for Support Naga in 2013. In pubs, I tend to find that with no overall consensus on your draft, it often doesn’t matter what you could have picked. You should try your best to make whatever you end up with work well. The point is that Medusa builds are refusing to adapt to change. Everything is changing year after year, but Medusas remain stubborn, and lack any sort of viability innovation. If for whatever reason you want to play Medusa, it make sense to attempt to be the most effective Medusa you can be. And stubbornness is unlikely to let you be this. I mean, a few months ago it was odd to put a “Hard Carry Void” in the offlane, but at TI4 it’s all the rage. IG.YYF did an incredibly potent MoM+BKB rushing Void during this tournament. I believe this is the most effective way to make Medusa fit into the current meta-game, by understanding that (like Void) she is great when 6 slotted, but very similarly building her in a way where she comes online earlier and is able to be potent with less. She won’t be changed the same as Void – they have different features – but a bit of fresh thinking would do her a universe of good. Now that I have explained how Medusa can do much better earlier now than ever before, I want to explain a Key Medusa Concept: The Gaze Predicament. When you use Stone Gaze, you put the enemy in a very precarious predicament. If they look at you, they turn to stone and take added Physical Damage (but less Magical) which also works on Magic Immune units. If they look away, they can’t cast a spell on you nor attack you for the entire 6 second duration of the ultimate. The ultimate also slows both movement and turning, making it harder to do something while you avert your eyes. This is honestly a “Damned if you do, Damned if you don’t” scenario. This Gaze Predicament creates a very crucial timing window for Medusa; there is a 6 second window where the enemy is guaranteed to be ‘damned’ (The Gaze Window). My concept behind Medusa, is that she needs to make the most of these crucial 6 seconds. I don’t think you should only stack stats so you can just tickle them, you need to be able to substantially wound them during the Gaze Window. Which comes in the form of Damage. I generally find that going something along the lines of Linkens > MKB is the best way to go about things. Linkens gives you a good foundation to exist off, while MKB gives you a massive increase in damage to wound people during the Gaze Window. You don’t want a long drawn out fight where you very slowly widdle away at 5 heroes. You want to do substantial damage in that short Gaze Window, preferable killing someone in it. Void wants to kill someone in a Chronosphere, and I put forth that Medusa also wants to kill someone in a Stone Gaze. This is especially possible with early damage, and against teams lacking in the communication needed to effectively disengage. I don’t think Medusa can follow the same path Void did, but I think she can become more and more like a Weaver. Linkens into Desolator is a very popular Weaver build, and it results in him starting with a good foundation of farm potential and survivability, before receiving a massive burst of damage. Before Desolator became the norm on Weaver, they used to opt for more late game oriented Radiance + tank item like Heart/Vanguard/Hood builds. Most hero trends are because a hero becomes popular in the pro scene, and the pros are building a hero differently than before, so the pubs start doing what the pros do. Pub players continue to play the hero the exact same way, until years later the hero becomes popular in the pro scene again, and pubbers change to this new way. This has happened with heroes such as Racecar Lifestealer and 1 position Gyrocopter among many others. The problem with Medusa is that she hasn’t had her surge in Dota 2 popularity yet, so we haven’t had an innovation shift for her for over 3 years. But where does this leave us? We know that Medusa is stronger early on than she has ever been before. She no longer has a 140 second cooldown ultimate at level 6, but a much shorter 90 seconds that works a bit differently. While Mana Shield is incredibly stronger early on. I also tend to find that afk farming just doesn’t fit in too well in today’s Dota. Ultimately I hope this article just makes you think about her in a new way, and pushes you towards new way of thinking regarding Medusa. See what you think of a Midusa, or perhaps getting a Drums. She isn’t the same old only-lategame Medusa she was many years ago, so it makes no sense that you should try and build her in the same way. I think getting nice Early-Mid items will do you a world of good, especially since 5-manning when the enemy has to fight into Stone Gaze is incredibly strong. In this article I have compared the differences in Win Rate difference of a hero in the Normal skill bracket, with that in the Very High skill bracket. Data is from two fortnights from 6.81b in July and August 2014. The first thing I noticed with my data, was that across the board the entire hero pool had a much smaller win rate range in Very High than in Normal. In the Normal bracket, Earth Spirit came last with a terrible win rate of 35%, while Necrophos topped with a 60% win rate. This meant that the win rates for heroes in Normal ranged from 35% to 60%. In Very High however, almost all the heroes that had low win rates in Normal gained a few percentage points, while all the heroes that had high win rates in Normal lost a few percentage points. The Win Rate Range for Very High was 42% to 57%. 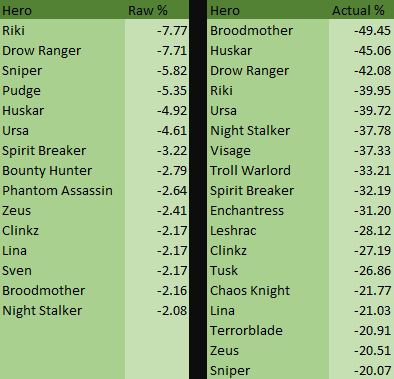 Out of the the 30 heroes with the lowest Normal win rates, 28 of them improved upon their win rate in Very High. For the 30 highest win rate heroes, 23 decreased in win rate. The heroes who gained the most seem to be an interesting collection of heroes, with a strong emphasis on low win rate heroes. Primarily heroes with a high Skill Floor such as Earth/Ember Spirit. There were some notable exceptions to the Win Rate Range trend however. 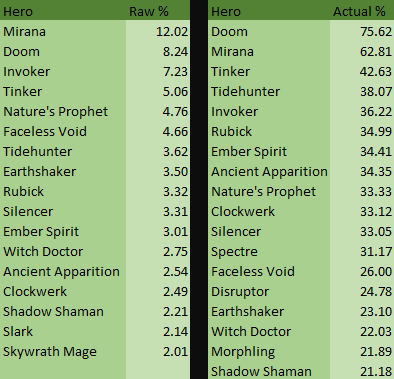 Pugna, Enigma, Doom, Skywrath Mage and Faceless Void all improved in win rate, despite not being that low to begin with. Enigma for example went from a solid 51.11% win rate in Normal, to a even better 54.63% win rate in Very High. I doubt much better micro has much to do with Enigma, so perhaps a combination of superior jungle efficiency mixed with effective pushing and the constant pressure of a well placed Black Hole. Could you argue that a low win rate hero improving is because they have a high skill floor, and if a high win rate hero is improving, they have a low skill floor and a high skill ceiling? Which might explain that while Void is strong in Normal due to the hero being easy to play good enough, as people get even better at placing his Chronosphere he shoots up in win rate. Resulting in Void being an entry level hero that has a lot of room to grow, perhaps akin to Blizzard’s Starcraft design philosophy of “easy to learn, hard to master”. There is a plethora of fascinating data with the heroes who lose Win Rate between brackets. There’s a heap of Supports that do much worse in Very High. Over half of the 20 heroes are predominately played as a Support, like Disruptor and Crystal Maiden. I’m honestly not sure what to make of this. A common criticism of low tier Dota is a lack of support heroes, but in Very High where they are more common, some just do worse. We then get to micro heroes like Beastmaster, Enchantress and Meepo, all of whom lose out. It has been hypothesized in the past that Meepo’s drop is a result of Smurfs skewing the Normal Data. But I disagree with this due to the sheer amount of Normal games, putting forth the idea that it’s probably more likely that Very High players are simply much better at playing against a Meepo. Especially with focusing their attacks so one of the clones dies quickly. Enchantress has a low 43.69% win rate to begin with, and then drops to 42.09% in Very High which makes her the lowest win rate hero in the bracket. Something is seriously wrong with Enchantresses in Very High for this to occur. Are they trying so hard to smoke gank that they get put behind due to ineffective rotations? Are they being too greedy and their Midas rush is costing their team dearly? Enchantress also happens to have an even lower win rate in ranked VH games, falling another raw percentage point. If you play in Very High, I suggest you leave Bambi on the shelf. But then what about Beastmaster? Why do Micro heroes like Chen and Visage gain in win rate, while Beastmaster falls off? Do low tier players not think about the hawk vision at all, perhaps causing them to constantly be spotted by it and never kill it? That’s just one possible reason I’ll put forth. It makes sense to me that PA, Sniper and Axe fall off in win rate, but BM is not a hero I would have guessed has a lower VH win rate. To explain data, there are two main ideas: are noobs really bad with some heroes, or are pros are just really good at dealing with them? There are of course other reasons that can explain it, but these are two reasons people are instantly going to think about. Interpreting Data is a very complex beast, especially when we are using data from tens of millions of games played all over the world. It’s all open to interpretation, and is very susceptible to misinterpretation as a result of a preconceived notions. On another note, Dotametrics did a similar article two years ago. There are some similarities with the results, like Axe and Sniper being worse in Very High. But there’s also a lot of differences, Beastmaster improved on win rate in his test back then. Whereas now it’s the complete opposite. Overall, this is definitely a very thought provoking data set. For non-noob Dota 2 tips and Mechanics, follow @ZotaTips on Twitter. I love stats, and in this post I have done the math and have compared the pick rates (popularity) of heroes in Unranked games to their pick rate in Ranked games. I thought this would be an interesting idea as people seem to be far more interested in winning when playing Ranked, and it would thus reflect statistically in the heroes they play. For this article I use both Raw and Actual percentages. A 2% -> 3% change is +1 raw percent, but is +50 actual percent as the hero is now in 50% more games than before. My data includes all games played in the Month of July. Mirana is played 62% more in Ranked, while Doom is played an incredible 75% more. So Mirana is in 19% of Unranked games, and 31% of Ranked games. This is a 12% raw increase, but an actual increase of 62% and makes her the most played hero in Ranked, about as popular as Pudge in Unranked. The hidden trend I see most prevalent is that a lot of these heroes have been favored in the pro scene over the last few months. In fact, the only heroes that stand out to me as strange is Witch Doctor, Silencer, Slark, and Spectre. None of these are all that popular in the pro scene, although Slark did have a good run in the pros for Jan/Feb 2014. The other three have never been a Top Pick in the pros, which is why I find them very weird to be played more in ranked. The only thing I find notable is that they all have over 50% win rate; Silencer with an impressive 54.9% win rate. It’s also interesting to me that heroes like Batrider and Lycan aren’t picked more, I guess people don’t feel like these heroes improve their chances of winning as much as a Mirana does. 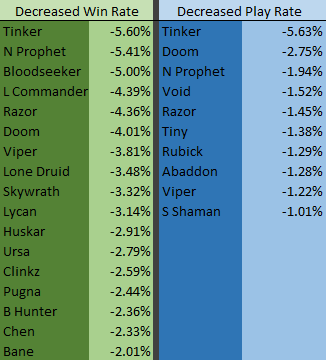 Some massive losses here, especially notable from Riki who maintains a very strong ranked win rate of 53%. The trend here seems to be an across the board abandonment of ‘pub stomp’ heroes, primarily roaming gankers that are unpopular in the pro-scene. Win rate doesn’t seem to be a factor here, as even Zeus, Sven and Ursa all have solid win rates above 52% (along with Riki). The issue seems to be that the heroes aren’t popular in the pro scene, and therefore are bad picks? That’s the only thing I can fathom from this data. While it makes some sense that popular heroes like Pudge and Sniper would fall, even very unpopular heroes like Night Stalker and Tusk fell. The pro scene popularity seems to be the dominate force here. My hypothesis leading into this was that people would pick a combination of heroes with high pub win rates and high pro pick rate. However this doesn’t seem to be the case. Win rate seems to be an almost non factor in picking. People don’t even seem to pick more ‘dominate mid heroes’ which is often considered a good way to boost mmr. For unpopular heroes, it seems that pro pick rate is the most dominate force here. Increases seems to be mostly dominated by heroes that have been popular in the pro scene recently, but they are still very picky with the heroes. Razor, Batrider, and Lycan are all hugely popular at TI4, but this has no direct surge for Ranked play. I find Pub Trends very interesting. There are about 30-40 million games of Dota every month, and large scale changes like these tell an interesting story. Some possible external reasons for changes could be the fact that Ranked only offers 3 modes, and newer players can’t play Ranked. These both can impact the data, perhaps lower tier players prefer ‘pub stompers’, resulting in skewed data since they can’t queue for Ranked. For reference, Unranked is still the primary way we play Dota, with about 75% of our games being Unranked (3:1 ratio). The amount of Ranked games also appears to be decreasing, and I’m not sure if people are unhappy with Ranked or if it’s caused by an influx of newer players, but I’m looking into it. If you’re interested in this sort of Data, this is just my first article of a couple I intend to do on Ranked Matchmaking over the coming weeks, so keep an eye out and thanks for reading. For updates on articles and a steady influx of Advanced Dota 2 tips, follow @ZotaTips on Twitter. Previous Stat Article – A complete rundown of the changes in hero pick rates for July, in both Pros and Pubs. Previous Feature – What I think Ice Frog should do after TI4, and I’m not talking about simple hero buffs/nerfs.